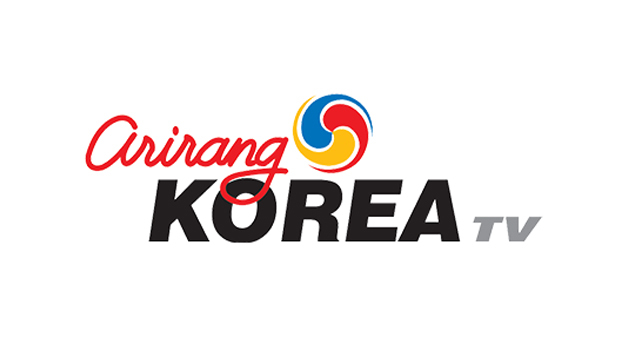 I’ve been living in Korea for over seven years now, so it pretty much feels like “home”—or close to it. But, every once in a while I do find myself missing home, the good ol US of A. These feelings of homesickness usually arise when I least expect them. They might spring up after a long day of work, or after a cultural misunderstanding. Either way, I usually turn to food (or something a bit more intoxicating) for comfort. 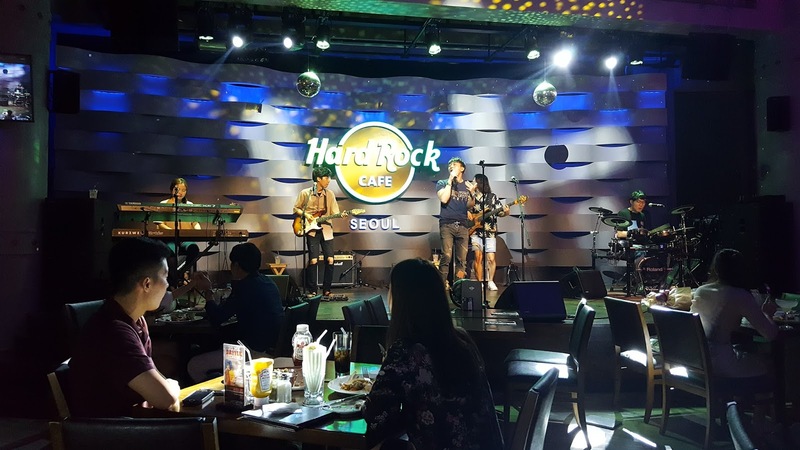 So, earlier this week, feeling a bit homesick following a particularly gruelling business trip, I made my way to Hard Rock Cafe Seoul. 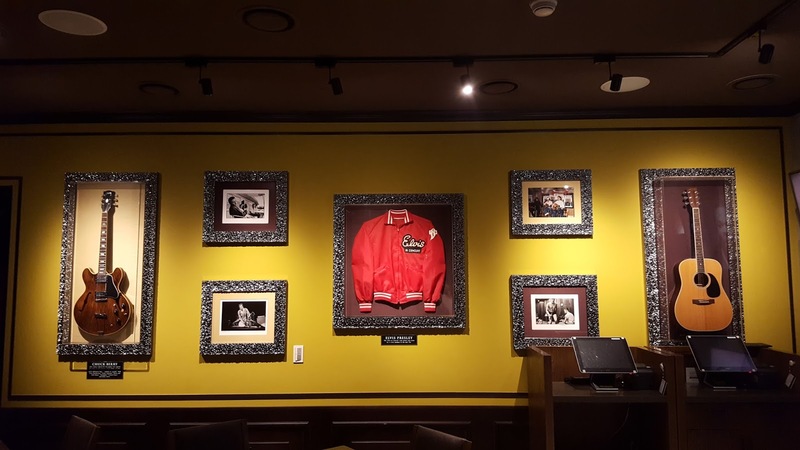 Because let’s face it… what’s more American than fast casual dining, rock and roll memorabilia and gargantuan portions? Even though the restaurant has been open since 2014 at the glistening Lotte World Mall shopping complex, it was actually my first time dining there. Hard Rock was super easy to find, thanks to the enormous, flashing neon guitar that drew a hungry crowd like moths to a flame. My friend Danielle and I were greeted by enthusiastic English-speaking staff and were seated at a table just in front of the Hard Rock stage. After scanning the rather expansive menu, we ordered a few dishes at the recommendation of the waitress. 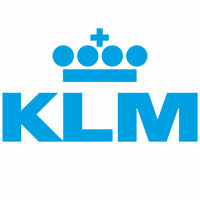 We were both really impressed with how friendly and international the staff were. By the end of the night, we had talked to employees from just about all corners of the globe. We unknowingly timed everything just right, as the live band took the stage just minutes after we placed our order. For the hour or so the band played, it was quite loud. Hard Rock isn’t necessarily a place you’d want to take your crush for an intimate first date. That being said, it’s ideal for a group of friends looking to get a little rowdy or let loose after a busy week. Reserve a seat at the window if possible, as it offers great views of Seokchon Lake Park. Even on a Monday night, the place was pretty packed and just about every diner in the spacious, two-floor venue (which boasts seating for 330!) was singing along with the band, who played a nice mix of music, from Sam Smith to Maroon 5. Our drinks were brought out in a timely manner. 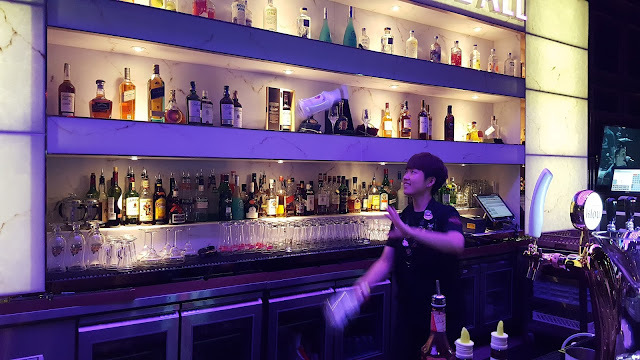 We tried the Big Kablue-na (₩12,900), a tropical mix of Malibu rum, Blue Curacao, pina colida mix and lime juice that instantly made me want to go to the beach, and the boozy Triple Platinum Margarita (₩15,900). This perfectly sweet concoction of 1800 Resposado, Cointreau Orange Liqueur and Grand Marnier got me buzzed a few sips in and kept me there til the end of the night. For those that don't drink alcohol, there's also an extensive menu of juices and smoothies that are just as delightful. We tried the non-alcoholic Strawberry Basil Lemonade (₩9,900m strawberries and basil, agave syrup muddled together with made-from-scratch lemonade) which was particularly refreshing on this hot summer evening. As soon as the Jumbo Combo (₩39,000) arrived, I knew we over-ordered. 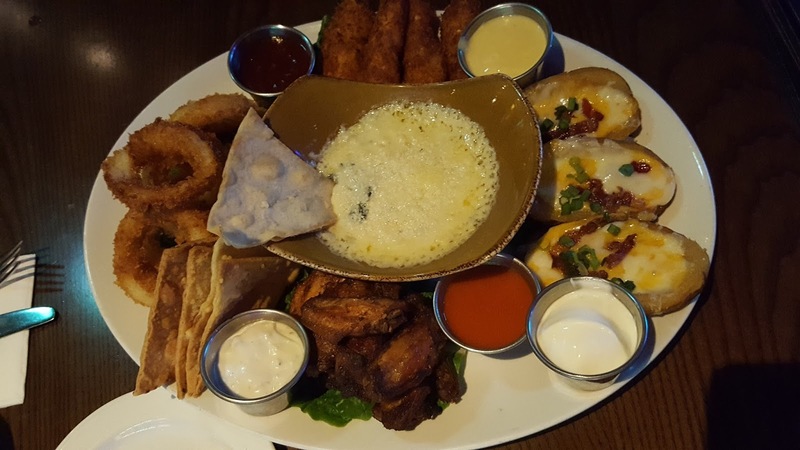 The huge platter consisted of the restaurant’s most popular appetizers, including buffalo wings, onion rings, chicken tenders, potato skins and my personal favorite, spinach and artichoke dip with Parmesan flatbread. God I’ve missed that stuff! All of it was good—simple pub grub that instantly made me feel at home. 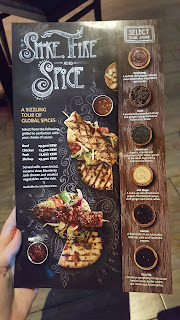 Hard Rock had just launched a new, limited-time “Smoke, Fire and Spice” menu on the day we arrived, so we decided to try it. 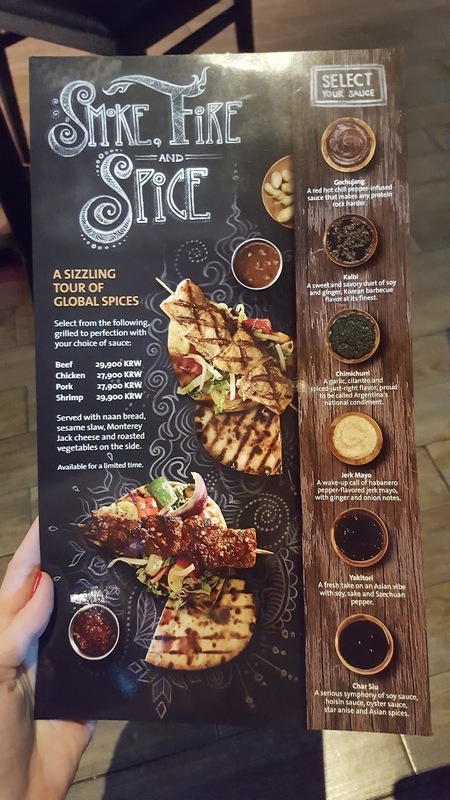 Diners can select from four meat options and six sauce options for the dish, which includes two meat skewers, sesame slaw, Monterey jack cheese and roasted veggies. 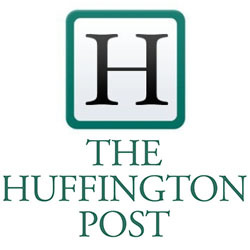 We selected Shrimp with Jack Mayo (₩29,900) and Chicken with Chimichurri (₩27,900). The flat bread and slaw were okay, but the skewers were fantastic. Both were really nicely grilled and the sauces complemented the meat perfectly. The Jack Mayo was particularly yummy, with a nice kick of spice and creamy texture. 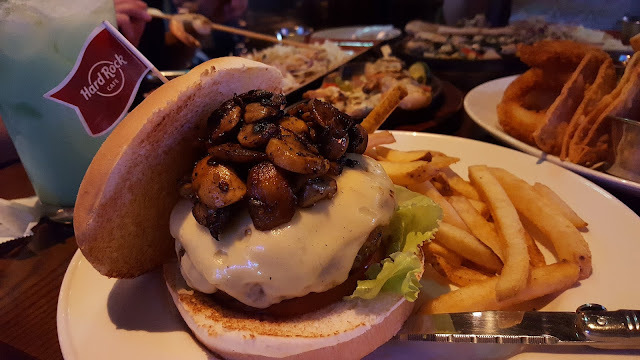 The real highlight of the meal was The Big Cheeseburger (₩24,900), an 8 oz premium grade Australian patty which was topped with Monterery Jack, Swiss, tomatoes, lettuce, red onion and braised mushrooms (₩4,900 extra). It was cooked perfectly to our liking, with just the right combination of juiciness and cheesiness. The bun was toasted, which is a must for me, and the fries, though fairly standard, were of a generous amount. At this point, we were stuffed and sadly had no more room for dessert though I was really dying to try the Fresh Apple Cobbler. Oh well. Next time! 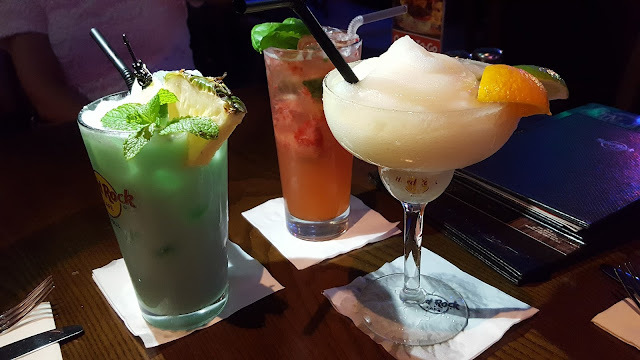 Throughout our dinner, things continued to pick up, which might have had something to do with happy hour, which is held nightly from 10 to midnight. Just after the entire restaurant sang “Happy Birthday” to a diner (which I had never seen happen before outside America), Danielle and I watched a cocktail show at the bar. There was excitement in just about every corner of the place. 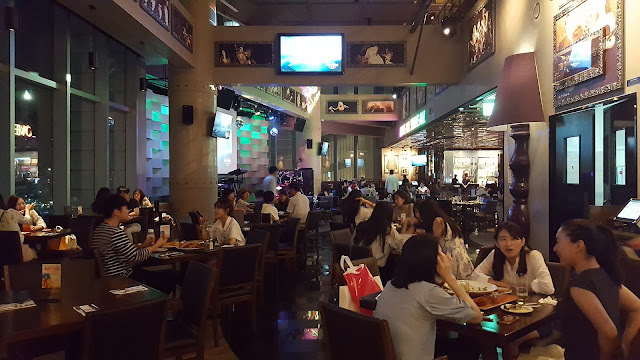 We even found a karaoke room on the second floor, which we learned can be reserved by groups that order ₩200,000 worth of food/drinks. Not bad, especially considering the room could easily accommodate around 15-20 people. Overall, our visit to Hard Rock Seoul was a great one. With good drinks, plenty of comfort food and live music (not to mention proximity to some of the best shopping in the city), there’s really no better place to spend a night with friends. 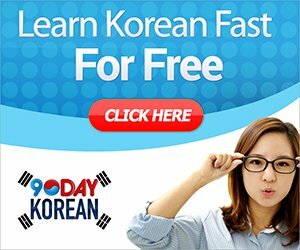 Yes, the menu prices are a bit steep compared to your average restaurant in Korea, but keep in mind, you’re paying for the atmosphere. And, considering that there’s not really any other place in Seoul that offers such a fun vibe, the price is well worth it. 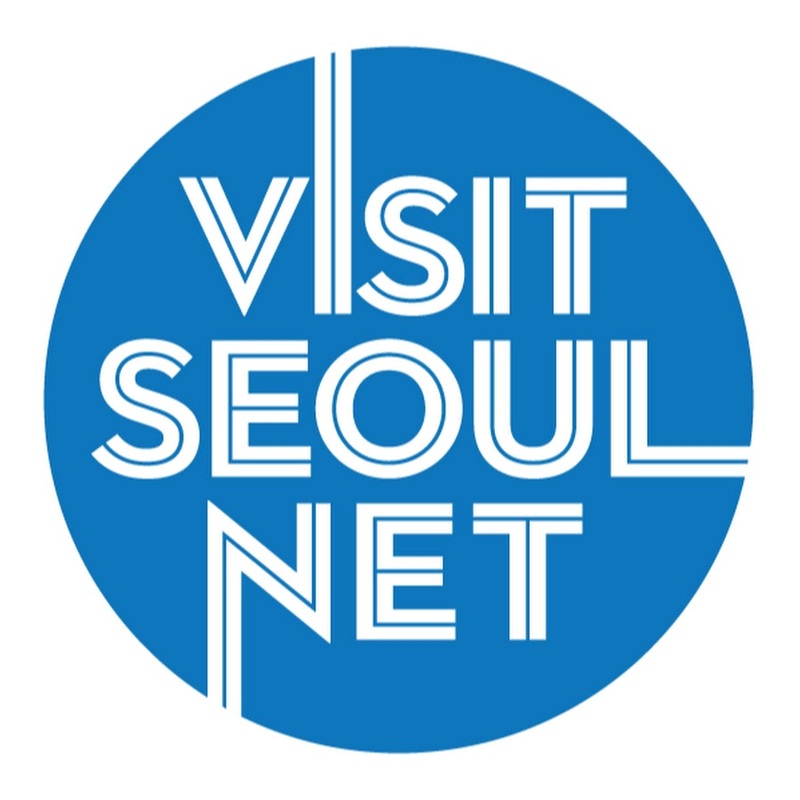 How to Get There: Take the Seoul Subway to Jamsil Station (Lines 2 and 8). 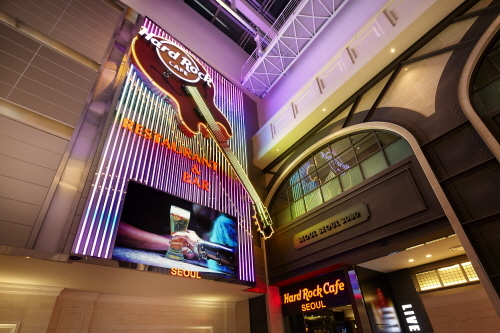 From Exits 1, 2 or 3, follow the signs to Lotte World Mall. Go to the 5th floor and look for the big neon guitar. Disclaimer: The meal mentioned above was provided in exchange for a honest review. The opinions are, of course, my own. I am glad that I finally got a chance to check out this place. Great views, food is nice. 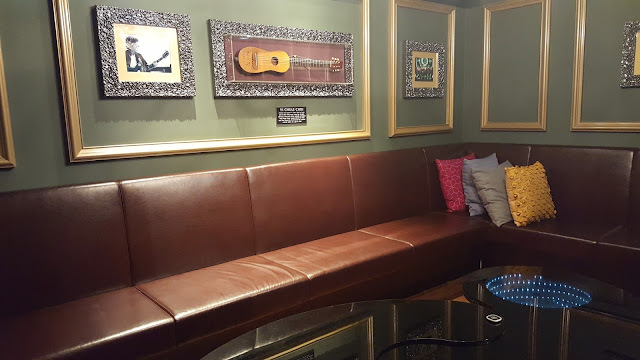 The quality of service at San Francisco venues was great, and the environment were pretty comfortable. I’ll say I will look forward to visit again.